Posted on Mon, Mar 19, 2012 : 12:52 p.m.
St. Patrick’s Day is one of the few holidays that can take what would be a quiet spring afternoon and turn it into one of the busiest days of the year for police. And that’s just what happened on Saturday. 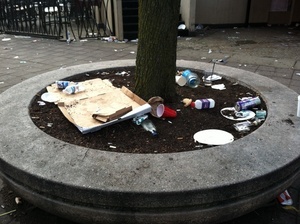 Trash was strewn on this planter outside of Good Time Charley's Sunday morning. Ann Arbor police responded to 475 calls for service between midnight Saturday and midnight Sunday, a little more than 200 more calls during the same time period a week before. Lt. Renee Bush said calls varied from disorderly subjects, drunken drivers, minors in possession of alcohol, noise complaints and even a person driving with expired license plates with an open can of beer and marijuana in the vehicle. “We just had it all,” she said. Bush said the day was on par with some of the fall Saturdays when the University of Michigan plays home football games. The most major incident occurred early on Sunday when police decided bars on South University Avenue had to close because of a large crowd of drunken and disorderly people. Bush estimated about 200 people were actually in the street and initial reports of thousands of people were a little bit high. Three arrests were made for disorderly conduct on Saturday and early Sunday morning, all on South University Avenue, Bush said. There also were multiple requests for ambulances and well-being checks, Bush said. Tue, Mar 20, 2012 : 2:57 p.m. I heard from some students who shall remain nameless, from EMU no doubt, joined UM in this revelry and mayhem to keep the UM and Ann Arbor Police on their toes, because they know that Ypsi and Washtenaw County Deputies will take care of it and there will be no problems. Besides, Ann Arbor has fewer police then they did last year and they need to be kept dancing on their toes. Tue, Mar 20, 2012 : 3:39 a.m.
Mon, Mar 19, 2012 : 7:31 p.m.
Michigan, North Dakota, South Carolina, Maine, Virginia, Wyoming, South Dakota and Georgia received failing grades in the State Integrity Investigation – an analysis of all 50 state governments conducted by the Center for Public Integrity, Global Integrity and Public Radio International. Mon, Mar 19, 2012 : 5:48 p.m.
Time out. Since it is a well known joke in public safety realms about the Police definition of a &quot;Call for Service&quot; is there any way to get clarification on just exactly what the AAPD considers a call for service? Is it 475 different runs/seperate emergencies, or is it mulitple calls for the same incident? Example; 5 different people all call 911 for the same passed out person. Is that one &quot;Call for Service&quot; or 5 &quot;Calls for Service&quot;? Or one passed out person has 4 PD units arrive to assist; is that one PD Call or 4 PD calls? Just something to ask about Kyle. Since the Police Service does a great job of marketing themselves, and the best way to market yourself is by numbers, a little clarification here would not hurt. Mon, Mar 19, 2012 : 6:43 p.m.
Mon, Mar 19, 2012 : 6:03 p.m. Being familiar with the system that Ann Arbor police, and several other area departments, use to catalog incidents/reports, I've found that this would indicate that if five different people called for one incident (or if several police officers responded to one place), that is one call for service. Mon, Mar 19, 2012 : 5:27 p.m.
Mon, Mar 19, 2012 : 5:15 p.m. When it's two days old, it's not news any longer. It is history. Mon, Mar 19, 2012 : 10:01 p.m.
Alan you must be very young and part of the Twitter generation. Or at least the segment of that generation that wants news immediately, with no depth or concern for accuracy, and then moves on to the next headline five minutes later. Alan, When we spoke to Ann Arbor police Sunday, they estimated the number of calls were double what they usually get on Saturdays. However, the numbers were not totally compiled yet as reports were still being processed. Mon, Mar 19, 2012 : 5:01 p.m.
Two hundred people is too much to handle? Looks like we need to either cancel Art Fair or hire more Irish cops!